I often go back and remake some of my old recipes, and when the original photo is really bad (as are most of my early ones), I take a new photo. Sometimes, however, I go a little bit further and change up the recipe so that it fits my current tastes. That’s what happened to this light, vegan coleslaw. 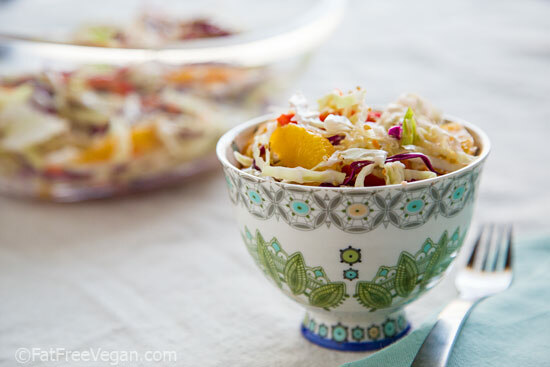 For my lunch today, I wanted to have this Sesame Orange Coleslaw that I created during my second month of blogging. But as I was preparing to make it, I noticed that the recipe contained more salt, sugar, and sesame oil than I would use today. So I remade the recipe according to my current tastes, reducing the sesame oil, changing the seasoned rice vinegar (which contains added sugar and salt) to regular rice vinegar, using stevia instead of sugar, and omitting the mirin (which contains both sugar and salt). And though I left the soy sauce in the ingredients marked as optional, I left that out of my coleslaw, too. And I loved it! I did spice up my bowl with some red pepper, and I turned it into a meal-in-a-bowl by adding chickpeas. 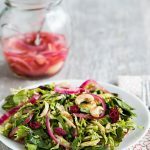 The orange juice and sesame oil give the salad a subdued sweet and nutty flavor, but the orange slices are like bursts of edible sunshine. You can adapt this recipe in any number of ways to fit your tastes. Like it spicy? Add cayenne or sriracha. Want to serve it as a one-dish meal? 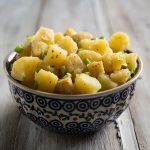 Double the serving size and add shelled cooked edamame or chickpeas. Need it lower in sodium? Skip the soy sauce. 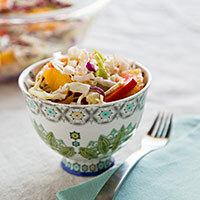 Combine the coleslaw, bell pepper, and orange slices in a large salad bowl. Mix together the remaining ingredients and pour over the vegetables. Allow the flavors to combine for at least half an hour in the refrigerator before serving. I used 6 drops of NuNaturals Alcohol-Free Liquid Stevia, but you can use any sweetener you like. Just start small and add it to taste. If you’re using real sugar or syrup, count on about 2 teaspoons. The sesame seeds and oil contribute about .81 grams of fat to each serving. This post contains an Amazon affiliate link to a product I recommend. When you buy something through my link, I receive a commission that helps support this site. Thanks for your purchase! I began eating vegan in August. Not just vegan, but fat free vegan. It was purely for health reasons – I have Lupus, and I was desperate to not have to go back on medication. Almost two weeks to the day I began, ALL my joint pain was completely gone. So, here, it is, months later, and I am still plugging away at this. It is REALLY hard because my family refuses to do this with me, and I am constantly surrounded by others eating things I should not eat. This past week has been particularly hard. I have one vegan friend, but I rarely see her. All that to say – your blog has been a true God-send for me. I have run to it so many times when I felt like caving. It’s always an inspiration — I cried tears from laughing so hard about your coffee ‘not being negotiable’ comment in this post. My husband says I like coffee so much that I like him more when he is drinking it. (Probably true!) I know you don’t know me at all, but you are like a forever-long time friend to me. Thank you so much for taking time to post your recipes and beautiful photos. I look forward to every one. I’m sorry that you’ve been having a tough time, but I’m glad to hear my blog has been a help to you. Have you tried joining any online groups? In addition to Cathy’s suggestion to find a local meet-up group, I think having the support of a few Internet friends is very important. I have a few suggestions if you’re interested. Susan, thank you for the recommendation to find a group. I have found several “meet-up” groups in my area, so now I just need to make it to one of the meetings. Unfortunately, I haven’t found any that are “fat free vegan”, and I’m a little worried I will end up going to something where they are serving or eating a lot of oil-filled, fake soy products. But, we’ll see. I also joined the Engine 2 Extra community online, which has been incredibly helpful this week. I’m really glad for that one — there is always someone online, so if you’re having a “moment” you can talk to a live person in the chat room! Quick question – do you ever use guar gum or other thickening agents to help the dressing stick to the vegetables? I’ve tried guar and xanthum gum a few times, but I usually reach for flax or chia seeds for thickening just because I find them easier to work with and they add some nutritional value to the recipe. I didn’t really feel that was necessary in this recipe because the coleslaw sort of marinates in the dressing, and I didn’t want it too be too thick. I too had no local friends or family who are vegan. I joined a vegan group through Meetup. We meet at different restaurants for a meal together and in the summer sometimes have a potluck picnic. My group is fairly active, meeting at least once a month. They also schedule meetups for pertinent lectures, classes, and movies. Give it a try. I’m the one-and-only plant-based eater I know, too, though several of my relatives are at least flexitarian and fairly supportive. I’ve checked meetup sites online and it looks like no one here (town of 50-60,000) uses them for ANY groups. Closest vegan group is in a large city in the next state, over 100 miles away. Between winter weather and gas prices, I’m not inclined to drive that far for a short meeting. Anyone have any suggestions for starting a group other than using meetup sites? Diane – is there a “Craigslist” in your area? That might be a place to advertise. It’s where I found our local meet-up groups. Thanks for the tip, Cathy — I found a local group. I hope to join them at their next “meet up”! Can’t wait to make this Susan! 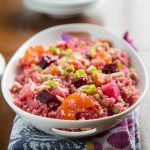 I forwarded this recipe to a bunch of my friends who entertain a lot and use a lot of bags of cole slaw mix. I’m hoping they get the hint (take all of the crap out of your salads people!). Thanks for another lovely and delicious recipe! I just have one question. 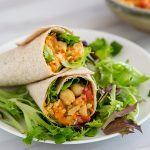 In regards to the chickpeas, is there another bean you’d recommend? I continue to try chickpeas but each time the results are disastrous. I’d appreciate any suggestions you have to offer. I think you could use any firm bean that you like, such as kidney beans. I prefer edamame, to keep to Asian flavors, but I didn’t have any on hand, which is why I used chickpeas. I grow my own stevia. Do you have any idea how much I would need to add as opposed to the liquid? Since it is such a small a,punt of oil is it really necessary at all? Sesame oil provides almost all of the flavor, so I consider it essential to the success of this recipe. Just a little goes a long way, which is why you can get away with only a half a teaspoon. What a great remake! It’s like coming back to a favorite book you haven’t read in years and noticing different things than the last time you read it, becuase you’re different now too! Very cool. The remake sounds delicious, and it looks beautiful too. I like the mix and match options for the dressing or eating it as a salad or a whole meal, and LOVE the little bowl it’s in. Great photo! Hi- This looks really good (& easy!) How long do think these will keep for in the fridge? I only have time to cook about 2x a week so I try to make a big batch of something to last a few days. Thanks! You mentioned in this latest blog of your you are decreasing your salt intake. How is it going and how did you do that? I am trying to do that however it is kind of a challenges. Also you mentioned you eliminate flour and sugar. Can you share how you did that too. Hi Antoniette. For salt, I am just cutting down on it, not completely out. I am trying to use less during the cooking and let people add it at the table if necessary. For flour and sugar, I just cut them out, cold turkey. It was extremely tough the first week, and the cravings nearly drove me crazy. But I got through them and it’s just gotten easier and easier. The one time I allowed myself some pasta, the cravings were back that night and the next day, so I’ve learned that for me, at least, it’s best just to stay away from all wheat and sugar. This looks like a really yummy and healthy meal! Hi Susan, Thank you for answering my question. What did you replace for your bread then. I don’t really have breakfast and if ever i go for a toast. I didn’t grow eating cereals. What do you normally have for breakfast. You mention that you don’t use pasta anymore, does this mean you don’t eat or make anything with pasta dish. Or you replace it with something. this sounds amazing. for some reason i’ve been craving coleslaw a lot lately. also your bowl is so pretty! This looks so refreshing and light! 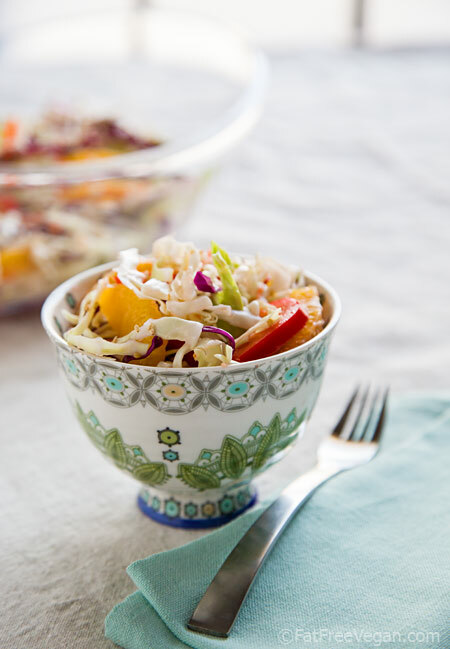 I love this type of Asian slaw because it’s a great way to get more cabbage into my diet. Great recipe! I just wanted to say thanks for all the great recipes and give some encouragement to anyone feeling down. I went “Esselstyn/mcdougall/fuhrman” a year ago and have since lost 100 pounds. My high blood pressure dropped like a rock, and my asthma mostly cleared up. My dad, and reason I went fat free vegan , before the age of fifty suffered a massive coronary artery dissection. Three months after me he switched too. He’s since lost fifty pounds and had his meds cut in half . He went from barely being able to get out of bed in the morning and practically being forced to retire, to running and lifting weights three days a week on top of working full time again. This week is his birthday. We’ll be celebrating with your garlic, and pepper tofu and blueberry chocolate cake. So thanks Susan for all the great recipes. I don’t know if we could have don’t this without you and all the others who give of themselves for the sake of our collective good health and prove it can be healthy and yummy to boot. Everyone else keep at it it only gets easier. Thank you so much for sharing this, E! I’m so happy to hear about both your and your father’s improvement in health. You are truly an inspiration! Thank you, Susan, for your generosity! I just finished the remainder of the slaw sprinkled within a regular eat-to-live salad, with a couple of splashes of apple cider vinegar to dress it a little more. I must say, the slaw was a fantastic addition, so much so that I think in the future I’ll try to make the marinade alone as a dressing for other salads. Thanks, Madam, for the inspiration! We make this all the time without the oil. We don’t miss it. Tastes great oil-free if you need to do that. Good to know! Thanks! A little crushed, toasted sesame seeds works, too.